perfect opportunity to create something different and upgrade the finish to your cupcakes at the same time! Choose from 5 different effects. 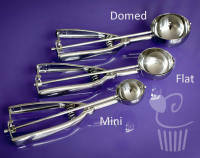 Ice Cream Scoop for FLAT topped cupcakes!